The Runes of the Infinite Mother are the original work of the great mystic and seer, Almine. “Through the ages runes have been sought through mystical practices and revelations, to bring guidance and to serve as magical power objects. The Runes of the Infinite Mother not only come as a great gift to fulfill these purposes but to deliver an even greater benefit: enhanced consciousness. The Runes are Activations that bridge outer cognition to the inner power to change your reality. 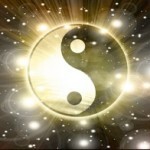 When the gap between outer and inner realities is closed, we have instant, magical manifestation. To access an online deck for a one-rune pick, click here: Pick a Rune to Inspire and Empower your Day! In using the Runes for guidance, manifestation, and inner mastery, you are led to cooperating with Infinite Intent in a manner such that all that shifts within is cause for changes without. The Runes form a ‘linguistic bridge’ that communicates between inner and outer realities and causes them to move in synchrony. As a tool, the runes help to interpret life and to refine perspectives, attitudes, and expression so that you are fully cooperating with the its flawless perfection. 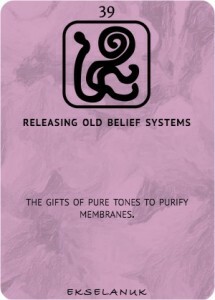 They help to clear the membranes between the fields of perceptoin, so that you may master the tool of transcendence, which enables you to operate outside of the the old energy source of polarity, becoming your own generating source of sustenance. So far, the meridians and chakras have operated in isolation or have been inactive, causing distorted perception and illusion. (You can read about the dysfunctionality in the chakra system in the Book of Runes, and in the meridian system in the Bridge of No Time. 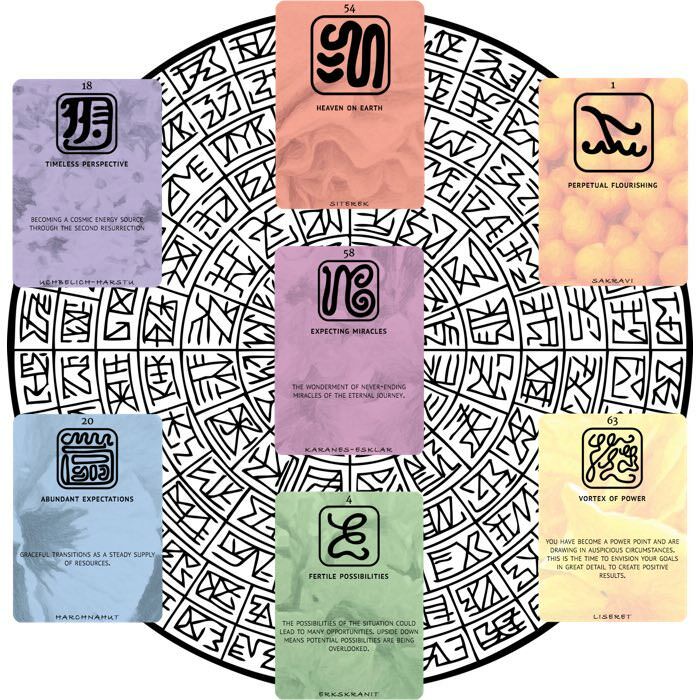 The Adventures in Boundlessness platform is fully dedicated to attuning to the higher reality of no opposites, and the Runes are used throughout. Almine received an 8th set of runes in 2016, which became accessible when it was time for those ready, to become sacred government on earth through self-government. This field corresponds to the High Mind aspect of the Inner Family, and is activated as we live archetypally, knowing that what we do affects all life in the cosmos. These runes are catalytic and accelerate the evolution of our consciousness. They are used in 3 spreads that support us as archetypal beings, able to impact on reality. They are also the rune set for the spreads of manifesting new realities through the cleared, purified, and activated meridian system. “Within the rich inner infrastructure of man, a river of untapped potential awaits discovery. Like the Yin and the Yang, the inner and outer realities are opposites, divided by their inability to communicate in a mutually understandable way. This seemingly insurmountable language barrier can be overcome however, by developing a linguistic bridge that communicates between the inner and outer realities. Such a bridge is provided by the ancient wisdom of the Runes. Almine has stated that the Runes are here to stay–they will support us through our leap in consciousness even beyond the resurrected state into the Incorruptible White Light. And they will evolve as we do. Almine received new spreads in April 2018 (from the Tablets of Fire), that work with the 12 ordinary and 8 extraordinary meridians, to be used in manifestation of new realities. Up to now the Runes have been for guidance, but we can get ready to step up our impact to include manifesting with their support. This requires profound clearing of the full ordinary and extraordinary meridians, as well as the chakras–all must operate at a higher level beyond the Dream of separation. And in June 2018 Almine received an extra 24 runes for the 8th field–this subset is called the Runes of the Cosmic Pulse, and it takes us more deeply into timelessness. Also around the same time, Almine received the 9th set of Runes – the Runes of the Unfathomable. These have profound insights on living inner and outer space indivisibly…becoming the living paradox and bridge between both worlds of form and formlessness. Anita received her Rune initiation from Almine in 2014, and was made one of 5 ‘placeholders’ worldwide. She trains small online groups to Mastery and Grand Mastery levels, with emphasis on a full understanding of the meridian system, fields of perception, and correspondences to the parts of the Inner Family, as well as hands-on experience of all the many spreads, via the Rune Mastery Environment–a software tool, training, and practitioner platform that gives you spreads ‘at your fingertips’. Training will prepare you also to work with clients if you so choose. Visit the Training Page for details. The Rune Mastery program is very comprehensive, and it will give you a very good grasp of how to empower yourself with the Runes.